And Ptoing ptoing ( ) is the first to complete a tile! Rock on! T81, please. Now that there are adjacent tiles. Damn these people crawl out of the woodwork for this challenge. More tiles are available. Get 'em while they're hot! What does the binary mean? Never done one of these before, when is the reveal? When it is 100% completed? Or are tiles revealed when they become surrounded? 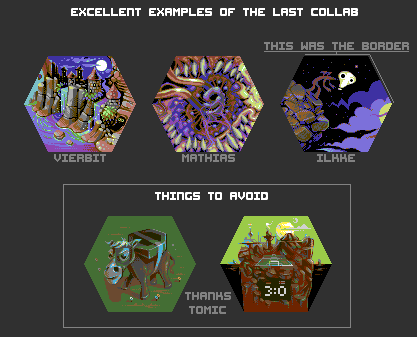 The goal here, with the larger palette, is to have a much more HD result that past collabs. Hmmm Xcom2 or pixel art?.. Have you finished your other one already, Finlal? @Ptoing, yes, sent to Indigo. Can send one to you if it's needed. Edit : holy hell, the number of near-dupes is making my eyes and brain hurt. I'm trying to challenge myself to use the entire palette effectively, but it is NOT easy! Edit : Made it! ....barely. Thanks for letting us know. I freed the tile. Looks like I won't finish T5 in time. Are there any penalties for that? Finlal, with the last 2 collabs I was lenient when it came to small overdues, but you would have to ask Indigo how he handles it. And you got 25 hours left, that is a good amount of time. I guess you got school/work going on as well, but just try to do your best. It does not have to be stellar or anything, as long as it is not sloppy and totally halfarsed. With the new system we got, expect more of these in the future. Hi! I would like T52, please! Could I reserve T19, please? Also, why does it say tile 74 expired? I sent it in on time. I'm guessing it's due to the site being down, right? I couldn't even start because Pixelation was down and I hadn't downloaded the border tile yet, can I have some additional time please? sure, the server thing was a bit of a pain. Can I take number 4? 4 is not green at the moment. So no, not right now. Only green ones. Just a few more tiles are left for claiming before I open up a new batch. This thing is turning out awesome so far. thanks for all the great work! Can I do tile 4? You.. already asked that a few posts up T4 is not up for grabs right now. Not broken, It got sent back for some revisions. i'll have a break for the week. due to the unexpected downtime, I've given everyone with a claimed tile an extra 48 hours to turn in their tile. Sorry about that, everyone! Fusionnist, what do you mean? Sending PMs should not be a problem at all. Just upload your tile to something like imgur or dropbox and PM a link to Indigo. May I change my tile to T89 from T52? I can't complete it in time and anyway never had any good idea of what to do there. But I thought of something interesting for 89. Update: Broke the curse and finished it. Finlal, Felt conflicted about this, but I think this fits into the rule "You can only claim one tile at a time." I don't think it'd be fair to just tile-hop when your time is getting low. You can claim a new tile once the timer is up. T27 looks like something interesting. Hopefully I won't fail to draw something there. I'm assuming you're claiming 27 then? I'll try to make something with T52. Edit: sorry, but I can't finish this tile. Hi, I would like to try T30. Tthirtytwo, I got my eye on you. It might just be that they haven't been added yet. We can't expect the mods to hawk these boards at all times! sent with 1m to spare! i'll probably grab another, but I'm interested to see what the next batch of greens frees up. Yep, I've sent mine in. I'm just waiting for the image to be updated. I assume it's the same with most of the other people who've expired / are expiring soon. Sent too. This is gonna be one big update. Sweet, I'll take T75 if I may! Let's see if I can finish this one. -YES. work-related issues have come up -- gonna have to release T75. I will defend ndchristie's honor. Thanks for claiming those last two. new batch available! T71 please! What else to do when you're home with a cold Done! When clients are late, better pixel than wait ! i'll try to do T66 in 66 hours. But what's happening with tile #75? Indigo, How often do you change the main picture? I want to make sure my tile was uploaded correctly. Finishing now . . .
Quick, guys! How do you pixel. Just a tip, probably obvious, but from experience I say can that: if you work hard to make all your transitions as seamless as possible, this thing will look really good in the end. When all the tiles' borders are obvious it really hurts the overall effect. A little late for such advice, but . . . I can already tell this one will be the best out of all 3. Can't wait to see it. meh, probably too much work whatever that might entail. Well, do we have an exact date that everything needs to be done by? There's three sets of tiles left, max. So, in theory, that should be at most 9 days. btw. Tile 71 seems misaligned, there is a horizontal line at the top. Looks to me as if the top line of pixels is missing, and just has the original grey colour there instead. Not sure if this is Reo's of Indigo's fault. I am sure Indigo will look into it. Little late with T38, working hard to finish it right now. Sorry, couldn't finish my tile. But I'm pretty sure I'll be able to do T54. Have a nice idea for it. is T33 still avaliable? If so, may I have it? Finished T45 so... T78, please! seems like i have hexquisite itching. maybe curable by a new bunch of tiles. These tiles are all going so fast! Can I try to do T-55? - Done! if it's a question, then no Only do it if you know you'll be able to finish it. Still want it? Can't wait to see it unveiled. So, wait, is it going to be unveiled here, or do we have to wait until GDC to see it? I don't mind either way. Do people have a strong preference? I will not be at GDC, so it might seem weird for me to prefer it, but I like the idea of unveiling it at an actual event. I want to see it and can't wait. Well, the suspense and surprise of waiting that long will probably increase the effect of its unveiling for me. I'm fine either way. Isn't GDC within 3 days? no, it's on the 18th, a week from today. Yes, save it for GDC! It's good enough timing. It's all about the presentation. Something for everyone here to look forward to, in due time. Dan, how will it work? Update original post in this thread at the same time you display it on a large screen at GDC or something? There's no live stream or anything I assume. This could be the beginning of a new standard for sharing Pixelation collab art, who knows. I'm going to stare at it for an hour. *edit hmmmm, I see a new large poster print in my near future . . .
Why not do both? Do a 'soft' reveal here for those who don't want to wait. i.e. private forum, PM for access. Then do a grand reveal at GDC. Yayy! Can't wait to see it revealed!! It would be really cool to see an animation of the tiles being added in the order they were completed too. Awesome . Looking forward to seeing it, the borders are so tantalising. Disappointed I missed my chance to participate but I'll definitely be in on the next one. Sorry but I had to "hack" it to see the result. Totally worth it! Congrats to all of you, it was really fun to pixelate with you guys. Awesome indeed. Much better than I could imagine. Congrats all. All that waiting time was worth it. Great collaboration. Wow, it very amazing! Well done, everyone! Can I use it as my new wallpaper? This is really well done. I can't believe how amazing it's turned out. Excellent work to everyone involved, and well done Indigo on organising everything (as well as the other mods doing their parts). 88 more collabs needed to be combined into ONE BIG COLLAB-HEXAGON. great collab. so beautiful, had been exploring it for about an hour i guess. big thanks to all and especially Indigo for the technical implementation - the countdowns, mouseover-function on the final piece etc. are a nice touch! Great job everybody, really cool stuff. And have to agree tomic that the technical implementation and organisation is top notch. Looking forward to the next one. WOW It's awesomeness made square ! Congrats to all, It was a blast doing this collab with you mates. And I love everything else too. This is lovely! Absolutely fantastic! I spent so much time thinking about what was in each hex. Now that it's unveiled, I've been taken by surprise in just about every one. Interestingly enough, there are some thematic coincidences like the solemn profile heads in T75 and T84. Crazy how that worked out, but stuff like that really ties all of this together. The most fun part for me has to be finally seeing what people did with my tile borders, though. Fantastic work everyone! You really killed it. For sure. I will organise one of these sometime later this year. Once I get a bit more free time after Bombernauts for example. Awesome! I'm in for the next one! !